This walkthrough may not be sold and may not be used for any commercial purposes. Neither is it permitted to publish this walkthrough in any way without the written permission of the author. Feel free to place this walkthrough on your web site or on your home page, on condition that no part of this walkthrough is changed and that the name of the author (Bert Jamin), the URL of the owner of this site ( www.gamesover.com ) and his E-mail address (gamesover) are mentioned unchanged. For the most up to date walkthroughs always visit www.gamesover.com. If you have any suggestions to improve this walkthrough, let me know by sending me an email: gamesover@planet.nl. You begin your quest standing in the desert. Turn around and walk towards the sign next to the closed fence. Walk around the sign and you'll see some kind of hand sign at the back. Touch the first hand sign and notice that a part of the sign will blink. Turn around and walk towards the right side of the volcano. Notice that there's a trailer in the distance. Walk towards the trailer and speak with the man in front of the trailer. It turns out to be a guy called Jeff Zandi. Listen to what he has to tell you. If you want to hear his story again just speak to him. If you got stuck you can also ask him for vital clues. Walk around the trailer and notice another hand sign. Touch the second hand sign and now two parts will blink. Turn around and notice a cleft nearby. Walk passed the cleft into the dessert. You'll see something lying around in the distance. Walk to that part of the dessert. The first item you'll see is a destroyed telescope you've seen earlier in good old Riven. You can't do anything with it. So walk further into the dessert. Nearby you'll find a skeleton of one of the sea creatures out of Riven. Walk into the head part of the skeleton. You'll discover another hand sign. Touch the third hand sign to activate it. Now walk back to the cleft. Notice the windmill standing near the cleft. Push the big lever and... nothing happens. Hmmm... could have imagined that! Walk around the cleft and enter it by climbing down the ladder. Walk down the stairs until you are standing on the platform with the two bridges. Notice that one of them is missing some planks at the end. Walk to the other bridge and walk across the bridge. That is as far as you can before it will collapse. Great... now you're standing at the bottom of the cleft. Turn to the right and notice another bridge hanging down from the wall. Climb up that bridge. Turn to the right and enter the lit room. Read the letter that is laying on the bed. It's a letter of Artrus. Leave the room and enter the other dark room. Press the fourth hand sign on the wall. Leave the room. Turn to the right and walk to the end of the platform. Look down and notice three wooden planks leading to the opposite side. Carefully step down the platform and cross the wooden planks. Step down at the left side of that small platform. Climb up the next hanging bridge. Enter the room. You can push whatever you want but nothing works yet. Walk down the stairs at the end of the room. Notice the big shaft leading up through the ceiling. Remember that out of use windmill next to the cleft. Pull the lever to set free the shaft. Climb up the stairs back to the other room. Leave the room and just jump down from the ledge to end up at the bottom of the cleft again. Walk towards the opposite hanging bridge. Climb up that bridge and leave the cleft by climbing up the stairs and the ladder. Walk towards the windmill. Push the big lever once more. Hey... it's working fine now. Enter the cleft once more, Climb down the hanging bridge. Turn to the right and walk towards the hanging bridge at the right side. Climb up the bridge and step of the ledge at the left side. Cross the wooden planks once more. Step down the ledge at the left side and climb the hanging bridge at the left side. Enter the room. Press the blue button next to the door. The door will close now. Make a note of the sign next to the door. 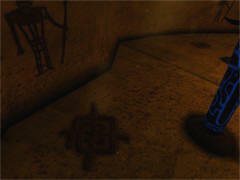 Examine the room and notice some sort of device with a blue lit button at the left side of the room. Make sure that the images on the device correspond with the images you just saw on the sign next to the door. Then push the blue button. Listen to Yeesha's story. She will tell you a long story in which she tells you that the hand signs are Journeys. You have to find seven of these Journeys over here and seven Journeys in each other Age you are going to visit. When Yeesha has gone, walk to the end of the room with the niches and push the fifth Journey at the left wall. Turn around and climb down the stairs to the other room. Push the blue button to open the door. Step outside. Turn to the right and walk down the last bridge. Jump over the part where the planks are missing. You can enter the room at the opposite side if you want but there's nothing of importance there. Walk to the right side of that ledge. Kick the pedal on the floor. This will lower a bucket. Jump down from the ledge and examine the lowered bucket. Push the sixth Journey on the bucket. Turn to the left, cross the water and walk to the second hanging bridge at your right at the very other end of the cleft. Climb up the bridge. Turn to the left, jump down the ledge and cross the wooden planks for the last time. Jump down the ledge at the left side. Climb up the hanging bridge at the left and look at the now closed door. Press the seventh Journey and notice that it is complete now. Jump down to end up at the bottom of the cleft. Relto actually isn't a real Age. It's more a kind of a bus stop. From here you can travel to all other Ages. Whenever you get stuck you can always link back to Relto to go to another Age. During your travels around the different Ages you'll find some Relto pages. By adding them to your linking book the outlook of Relto will change a bit. Look around and notice four wooden pillars and a house. Walk towards the house and open the door. Enter the house. Next to the closed window you'll see a small handle. Push the handle to open the shutters. When you examine the room you'll see an empty book case at the left side, a closet and another book case at the right side of the room. When you open the closet you can change clothes if you want. You can change your appearance every time you visit this room. Walk towards the book case at the right side. Take the book and read it. It describes the four Ages you have to travel to, the Teledahn Age, the Gahreesen Age, the Kadish Tolesa Age and the Eder Kemo & Eder Gira Age. Notice that the pages are numbered in D'ni-numbers at the bottom of each page. Now you have the D'ni-numbers from 1 to 8. Make a note of these D'ni-numbers with their corresponding normal numbers. You are going to need this later in the game! Leave the house and walk towards the four wooden pillars. 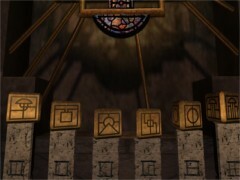 Each of these pillars contains a linking book to one of the four Ages. First thing I did was opening all of the pillars and get me linked to the corresponding Age and get me linked back to Relto again. So I gathered all linking books at the same time. You can do this in a different way if you like of course. Let's start with the first one at the left. Press the hand sign. It lights up green and it opens. Click on the linking book and on the image. This will take you to the Eder Kemo & Eder Gira Age. When you arrive there just click on the linking book at the left corner of your screen. Click on the linking book to open it and click on the image to get yourself linked back to Relto. When you return to Relto you'll notice that there is a red book in the book case at the left side now. Go outside again and now press the hand sign of the first pillar at the right side. It lights up orange. Click on the linking book and on the image to go to Teledahn. When you arrive there return to Relto again. Now there is also an orange book in the book case. Exit the room and press the hand sign of the last pillar at the left side. It lights up blue. Click on the linking book and on the image to go to Gahreesen. Link yourself back to Relto again. Now there is a green book added to the book case. Go out once more and do the same with the last pillar at the right side. This one lights up purple. Click on the book and on the image to go to Kadish Tolesa. Link yourself back to Relto once more. Now you have all linking books for the Ages gathered! 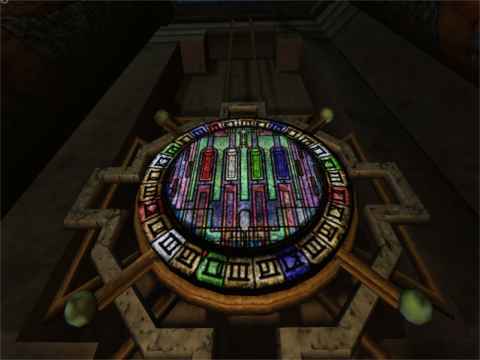 From the left to the right you have a green book linking to the Gahreesen Age, an orange book linking to the Teledahn Age, a purple book linking to the Kadsih Tolesa Age and finally a red book linking to the Eder Kemo & Eder Gira Age. Notice the little green squares beneath each book. If you ever want to reset one of the Ages to start it all over just press the square beneath the appropriate book. You are standing in a hut. Notice the manhole on the floor. You can try to open it but it won't budge. It's firmly locked. And that's just good because the room beneath it is floated with water. So opening the manhole now would bring you nothing but death by drowning. Leave the hut and walk along the platform to the back side of the hut. There you'll find the first Journey of this Age. Press it to activate it. Walk back towards the entrance of the hut. Cross the bridge and go to the left. At the first intersection go to the right. Keep on walking and go the first intersection to the left. Walk until you reach the platform with the antenna, the telescope and a device with the yellow flashing D'ni-number 3 on it. So press that device tree times to bring out the antenna. Now walk to the opposite side of the platform and look trough the telescope. 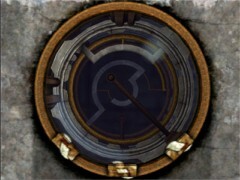 Notice that it has a metal ring at the center. Also notice that it has four buttons to press. One at the left, one at the right and two at the bottom (up and down). By pressing these buttons you can move the telescope in the corresponding direction. Your goal is to find the sun and track it down in the center ring. This will power up the surroundings. The best way to do this is waiting until the sun comes bye and then simply "catch" it in the center ring. Once this job is done, leave it alone and you'll have power all the time. Walk around the platform and notice there are three big levers surrounding the platform. Pull all three of the levers. One of them is broken but you don't need that one. Notice that there is another walkway leading down the platform. It's broken halfway, so no use to walk that way. In stead of that walk the walkway on which you came to the platform. At the junction go to the left. Walk all the way to the end. Notice a lever and a staircase leading down the walkway. Leave the lever alone!!! Also notice that there is a huge bucket hanging next to the railing. Your goal is to flip the lever (not yet!!! ), run down the staircase and climb into the bucket to get a free ride up. Is that all there is, you might think... Well... not quiet. The problem is that you only have about five seconds to climb into the bucket after you flipped the lever. After that the bucket will start it's way up leaving you behind at the walkway! I'll bet you'll have to give this a try more than once (as I did :o). If you fail you have to pull the lever again to get another bucket stopped at the correct spot. Here's my golden tip. If the bucket left without you, walk towards the lever. See how the buckets are going to the top into another building. You can also see how another bucket will be lowered. As soon as a bucket has left the top building flip the lever and the bucket will stop at the correct spot. When you finally entered the bucket in time enjoy the view! When you are delivered by the bucket walk down the platform. Examine the room and see that there are two other niches with a telescope. Between these niches you'll find the second Journey. No need to say that you have to activate it. If you want you can have a look through these telescopes of course. Now walk around the room and locate the elevator. Next to the elevator at the right side you'll see a pedal on the floor. Kick the pedal to release the brake of the elevator. Turn to the right and walk towards the small control panel. Click on the control panel to sit down. Examine the controls but don't touch anything before you know what you are doing. If you do things different as described or in a different order you might get stuck further in the game! The lever and the button at the left side are controlling the buckets. No need to change that so leave them alone. The center lever will drain the water from beneath the manhole in the hut. So flip that one. Notice that it is slowly going back to top position and that the pointer at the left of it will slowly go down. Wait until that's all done!!! When it stops, all the water beneath the hut has gone. Now flip the right switch near the red light to unlock the manhole in the hut. With the most right buttons you can switch on and off the lights over here. Leave the control panel. Step into the elevator. Press the blue button to go up. Leave the elevator and press the third Journey next to the window. Move the lever next to the window to get some light in the room. Examine the table with all the papers near the window. Read all the papers. There are two important papers. One is the manual about the fish tank. It says that for the models III and IV the light switch has to be pressed for longer than three seconds to open the lower portion of the tank. The other one is at the center of the table, giving you some vital information about - as you'll see later on - seven pressure plates. Leave the table and walk towards the fish tank. At the left side of the fish tank you'll find the first Relto paper. Pick it up and click on the image. It will be added to your linking book. Now press the red switch on top of the fish tank for at least three seconds. When you let go, the lower portion f the tank will lower. If not, you didn't press the switch long enough. Click on the appeared linking book and on the image. You'll end up in another office. Turn around and walk towards the desk. Read all the papers and if you have time enough also read the diary of Douglas Sharper to learn lots more about the Teledahn Age. Now walk into the room with the telescope. Of course you can have a look through the scope. Look at the left wall. In stead of the expected Journey you'll find a Journey stone. Click on the image to get yourself end up on some sort of platform in some sort of swamp. There's nothing to do there. Your only way out is your linking book to Relto. So click on your linking book at the left corner of the screen to get back to Relto. Notice that there is a new brown book added to the book case. Take that fifth book and click on the image to get back to the office you just left. Walk into the room with the paintings. Click on the linking book on the pedestal and link yourself back into the office with the fish tank. Walk towards the elevator. If the elevator is not there, press the blue button. Enter the elevator and push the yellow button to go down. At the first stop you are back in the control room. No need to go there again so press the yellow button once more to go further down. Now you are stopping in front of the hut. Exit the elevator and walk towards the hut. Enter the hut. Notice that the red light at the manhole is lit. Open the manhole. Climb down the manhole and go all the way down. You'll end up in a huge empty water basin. Notice that there is another ladder leading down. Climb down that ladder. You are now standing in a water pipe. Walk through the pipe. After a while you'll come along a little lit area. Shortly after that there's an opening in the water pipe at your right leading to a staircase. Climb up the staircase. You'll enter a sort of prison cell. At the wall next to the entrance you find the fourth Journey. Don't forget to activate it! Now the next question is how to press four plates at one time! Well... that's easier done than said. Simply move a stone on the two pressure plates in front of each door. When you've done that the doors will open. Enter the next room. Walk towards the controls at the wall. You only have to flip one of the levers to get the next door opened. It makes no difference which lever you flip. You never know if you have to return here later so let's flip the center lever which is easy to remember. Go through the new opened door. Walk to the opposite side of the room and enter the little corridor. You are standing on a wooden platform now. Turn to the right and walk down the wooden planks until your way is blocked. Take a few steps back and run and jump against the plank that is sticking up. Keep on walking and climb up the stairs. Walk towards the wooden crates. Open the door and enter the room. Examine the room. It has lots of crates, mushrooms and a few drawings. Notice that beneath the metal pathway there is another Journey stone. Leave it alone for now. Climb up the metal stairs. open the door at the end of the pathway and enter the room. Keep on walking until you pass the orange light on the floor. Walk to the left and activate the fifth Journey. Walk down the corridor next to the Journey. Walk all the way until you are standing outside. Go down the walkway. At the very end you'll see a device similar to the telescopes. The difference is: this one can shoot! Nice! Look through the telescope and notice that this one goes the same as the normal telescope. It however does have two extra buttons, the blue blinking button on top and the big button to zoom in or to zoom out. While you are looking through the telescope find a hanging ladder on the opposite rocks. Notice that this ladder is kept in place by some rocks. Aim the telescope on those rocks, zoom in and shoot them away. Now return to the place with the wooden crates. Climb the crates next to the door. Climb further on the ledge next to the door. Jump to the other ledge passed the door. 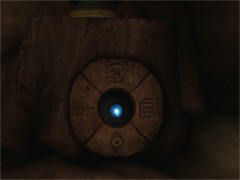 Press the sixth Journey. Climb up the ladder you just shot free and enter the room. At the right wall of this room you'll find the seventh Journey. Activate it. Leave the room via the opened door at the opposite side of the room. Climb down the stairs and open the door. Enter the room and climb the metal stairs once more. 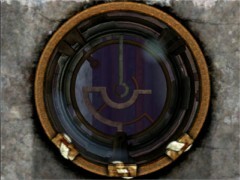 Go through the opened door and touch the hand sign on the circular shaped Journey door at the right wall. Enter the room and walk straight ahead into the darkness until you'll hear Yeesha again. You'll arrive in an empty room. Only one ivy is decorating the place. Somehow I get the feeling this room rotates. There is only one exit to the room. So exit the room by that way. Read the sign that is standing next to the next door. It says where you can retrieve your KI. It's a device to open doors and elevators. That seems important to me so let's get one! Go through the door and to the right. Pass the next door. Walk until you reach the under construction sign. Enter the room to the right. Notice that there are some cupboards hanging on the walls. Walk towards the last cupboard to the right passed the orange light on the floor. There are some books and a Journey stone inside the cupboard. Touch the Journey stone and press the image to get yourself linked to a balcony with a view over the city D'ni. When you've seen enough link back to Relto. Walk towards the book case at the left. Notice that a new book appeared in the right part of the bookcase. It's the blue/gold book. Open the book and page through to see the places you just have visited. No need to go back there right now. So close the book and take the green book. Click on the image to get back to the entrance room of Gahreesen. Exit the room and go passed the next door. Go to the right again until you're facing the under construction sign. Enter the room to the right once more. Go passed the door to the left this time. Now enter the room with the KI-device dispenser. Walk towards the machine with the blue lit sign. Press the blue sign to get yourself a KI-device twisted around your hand. Turn to the left and notice another under construction sign. Walk passed that sign and enter the next room. Be careful not to step down the crevice yet! In stead of that jump across the crevice. Climb up the debris. Walk a little further until you are standing in some sort of doorpost. At the right side you'll find the first Journey of this Age. Activate it of course. Climb back over the debris. This time jump down the crevice. Pick up the Relto page. Click on the image to add it to your Relto linking book. There is only one way out of the crevice and that is linking back to Relto. Notice there are now some rocks and tree stumps added to the landscape. So that is what these Relto pages actually do... adding things to the Relto place. Walk towards the book case. Get and page through the green book. This time click on the Journey sign to get yourself linked back to the room with the debris. Climb the debris once more and exit the room through the door at your right side. Go to the right and walk through the corridor. Go passed the next door. Shortly passed this door you'll see a crack in the wall at your right side. Enter that room. Climb up the metal pipes in front of you. Walk to the left and activate the second Journey. Step down and climb up the metal pipes on the opposite wall. Walk to the left and climb up the steel beam. Jump up the next crack in the wall towards the two orange cones. Jump al the way up. Cross the wooden plank over the gap. Go through the crack in the wall at your right side. Walk passed the next under construction sign. Enter another crack in the wall. Notice that there is a rotating part at the end of the crack. Stand in front of this rotating part and keep on walking against it until you are taken to another dark pathway. Immediate turn around and face another rotating part. This rotating part is made of solid stone. When you'll wait for a while you'll see to rooms passing by. One room is the small corridor leading to the under construction sign in the corridor you just came from. The other is a bigger room with some sort of device. As soon as this bigger room appears quickly step into that room. If you make the mistake to end up in the corridor with the under construction sign... try again! Examine this room. There is some kind of huge wheel laying on the floor. Notice that there are two pedals next to the wheel, one at the left and one at the right. At the wall at the back of the room you'll see four signs and four buttons. At the left side from these controls you'll see a Journey attached to the wall. Passed this wall you'll see a grate on the floor. When you step on this grate a huge column will start rising. Your goal is to power up this Age with this grate, the controls at the wall and the pedals next to the wheel. It's just a matter of being quick enough. Let's get started! Step on the grate to get the column into the highest position. Quickly run to the most left button of the controls at the wall. Push the button and quickly run back to the grate and step on it to get the column into the highest position again. Quickly run to one of the pedals near the wheel and kick it down. Quickly run back to the grate and step on it to raise the column into the highest position again. Quickly run to the other pedal and kick it down as well. Quickly run back to the grate and step on it to raise the column to the highest position once more. Now run to the controls at the wall and push the second button from the left. After the wheel has gone up press the other two buttons of the control. If you aren't quick enough and the column goes all the way down before you step on the grate you have to start all over again. After you powered up the Age press the third Journey. Now you have a good saved point. Turn to the left and walk passed the grate and the column and exit through the door at this end of the room. Walk through the corridor. The first door to the right will lit green. Only blue lit doors can be opened so walk passed this door. Go passed the next door in the corridor. Keep on walking until you reach the under construction sign. Enter the crack in the wall at your right side. Now you're back in the room with the orange cones and the wooden plank over the gap. Simply jump down into the room with the debris. Jump across the crevice. If you end up in the crevice link back to Relto and click on the green book. In that case click on the Journey sign to get back to the control room where you powered up the Age and try again. Exit through the door and you'll be back in the room with the KI-device. Go through the door opposite to the KI-device. Walk straight on to the door with the green light. Push the green light and enter the elevator. Once you are on top of the building, walk to the left and step on the walkway that's leading out. Enjoy the view but be careful not to fall down! Wait until the black rock with another Journey is passing by. Jump from the walkway onto that rock. Press the fourth Journey. Now turn to the left and notice another rotating building. This one has very long walkways sticking out. Your goal is to jump on one of the walkways. If you fail you'll be linked back to Relto. In that case click on the green book and on the Journey sign to get yourself linked back to this black rock with the Journey and try again. When you made the run and jump successfully walk all the way to the door of the building and enter. Climb up the stairs and go through the next door. There are a few things to find in this building. I can't tell you exactly where you can find the different rooms of this building. That depends on which walkway you jumped on and by that by which door you entered the building... So look around until you find: the blue KI data notebook, the Journey stone, the green Gahreesen data notebook and last but not least another Journey. First find the room with the green Gahreesen data notebook on the table. Page through the notebook to learn more about Gahreesen. Walk to the opposite side of the room and press the fifth Journey. Now find the room with the blue data notebook on the table. Read this notebook also to learn more about the KI-device. Walk around the room and find another Journey stone on one of the chairs. Activate it and you'll end up on some balcony in D'ni city. Link back to Relto. I bet you think we are going straight back to Gahreesen. Well no... first we go on a small side trip to Teledahn. So take the orange book and click on the Journey sign. This will link you to the room you entered via the ladder. Turn around and exit via the door. Climb down the stairs and enter the next room. Turn to the left and walk towards the metal passage at your left. Stand between the wooden crates and the little mushrooms. Walk a little to the left and touch the Journey stone. Click on the image to go to prison in Gahreesen. Look around and notice another Relto page laying on the bed. Pick it up and press the image to add it to your Relto book. Turn around and press the sixth Journey. Jump down the manhole. Look around and walk towards the windows with the bars. Stand still at the crossing. Look to the left and to the right. Each path is blocked by bars. Turn around so that your back is pointing to the windows with the bars. Walk straight ahead into the corridor. At the first crossing go to the left and walk into the inner green lit corridor. Keep on walking until you reach the blinking green light. Walk passed the next green light. At the next crossing turn to the right and walk towards the steel ladder. Climb up the ladder. Turn to the left and walk through the corridor. Enter the door to your left. Walk to the center of the room. Climb up one of the two steel ladders. You'll end up on the roof of the rotating building. Walk to the outer walkway. Walk around this walkway and press the seventh Journey which is attached to one of the pillars. Link back to Relto. Because you added another Relto page to your linking book, the island now has a lake at the right side of the house. You can go and watch it if you like. Get the green book from the book case. Click on the Gahreesen image to get linked back to the entrance room. Head back to the room with the KI-device. Go through the opposite door and enter the elevator once more. Stand on the walkway on your left. Wait until you face the black rock with the Journey again. Make another run and jump to get on that rock. Now be very carefully!!! Slowly walk to the edge of the rock. Look down and notice a big rock is sticking up, Look to your right and notice a Journey door deep down there. I guess you know what your next goal is. Yep, you have to run and jump down to the rock in front of you and from that rock you have to run and jump to the Journey door. First press the Journey once more to get yourself a good saved point. Let's go!!! Line up with the rock in front of you. Walk backwards a little and run and jump down the rock. Walk to the right edge of this rock and line up with the Journey door and repeat the running/jumping trick. If you fail you end up at Relto click on the green book and on the Journey sign to end up at the black rock and try again. Turn a little to the right and go through the small passage. Walk all the way to the end. Climb up the stairs. Walk around the room until you face the gap in the floor. Turn around and walk towards the last pillar. Press the first Journey of this Age. Turn around and walk towards the gap in the floor. Line up with the opposite side and make a rum/jump to the opposite side. Walk further around the room and climb up the stairs at your right. At this platform you'll find a strange shaped device to the left and a linking book to the right side. You can have a look through the device if you like but don't touch the buttons yet! Walk towards the linking book and get yourself linked to a room full of great paintings. 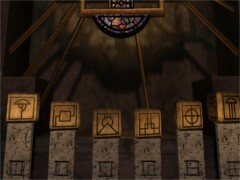 And these aren't ordinary paintings but also great hints how to solve some of the puzzles in this Age. The 5 most important paintings are the next. After you link back to the Age you have to adjust three devices corresponding to these three images. Click on the image to enlarge to have a better view. Hey... now you have set it alright but nothing happens! That's correct you need to set another two of these devices in the correct way to get something happening! Climb down the platform. Go to the left and leave this area via the stairs at the right side just besides the gap in the floor. Keep on walking passed the arch with light attached to it. 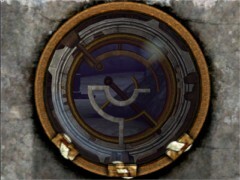 Go through the circular door. At the intersection go to the left. Walk towards the platform and climb up the first stairs. Go to the right and press the second Journey at the wall of the platform. Walk back towards the stairs you just climbed up. Don't climb down but proceed further around the platform. 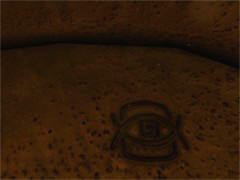 In the niche next to the next stairs you'll find another Journey stone. Jump to the Journey stone and click on the image to get yourself linked to another balcony at D'ni City. Enjoy the view and link back to Relto. Take the purple book from the book case and click on the Journey sign. 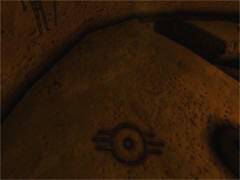 Walk around the platform once more towards the niche where you just found the Journey stone. This time climb up the stairs to the platform. Walk towards the device. ...and for the last time! This time something is happening. While you are still looking through the device you'll notice that in the distance something is moving aside. Now walk passed the device and notice that in the distance is a device looking similar to this device. Walk passed that device and enter the hidden door that you just opened. Exit this hallway through the opposite door. Press the blue button. Turn around and re-enter the hallway. Walk towards the closed door and press the third Journey. Turn around and exit the hallway. Walk onto the balcony at the end of the corridor. Turn to the right and walk down until you reach the five balconies with a blue button on each and every balcony. Now look at painting 2 in the room with all paintings. Notice that there are five blue dots at the left side of the painting. Also notice that button 2, 3 and 5 from top to bottom are lit. 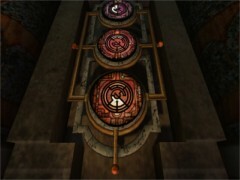 These represent the five buttons on the balconies. Last but not least notice the red dot at the right side of the painting. This represents the starting point of stepping on the tiles. So on your way down press the second, third and fifth blue button. Now walk all the way down but make sure you stay on the outer rim of the floor. Turn to the right and keep on walking on the outer rim until the angel of the camera changes. You'll see what I mean with that. Turn around and walk a little bit back until the angel of the camera changes again. Have a good look at the outer rim and notice a little more bright part on the outer rim. This is your starting point indicated with the red dot on painting number 2. Turn around and walk down towards the just revealed door. Go through the door and climb the stairs. No need to push the blue button. If you press the button it will reset the tile floor puzzle. So... you better leave it alone. Keep on walking until you are standing in the area with the purple lit lake. Turn to the left and keep on walking until you reach the crevice. Notice that there's laying something on the ground in the distance. So run/jump over the crevice and pick up the Relto page. Click on the image to add it to your linking book. Turn around and run/jump back over the crevice. Turn to the right and climb up the stairs. You are facing a huge pyramid now. Walk towards the right side of the pyramid and go around the corner. Halfway the pyramid turn to the left and jump into the niche. Turn to the left and press the fourth Journey. Walk back to the entrance of the pyramid. Climb up the stairs to enter the pyramid. Climb up the small center stairs and press the blue button. This will lit the room. When you stepped on the correct tiles the last one turns out to be an elevator which takes you down. When the elevator stops, just get out or it will take you up again. Leave the blue button alone. If you press it, it will reset the puzzles you just solved and by that there will be no way back! Walk through the corridor. At the right wall near the exit press the fifth Journey. Turn to the left and enter the next room. When you enter the room turn to the left and step on the little platform with the levers so you are facing the center of the room. In front of you there are four pillars sunk in the floor. Your goal is to raise the correct pillars by pulling the levers in the correct order. The blue button at the right side will reset the pillars. Number the levers from 1 to 4 from the left to the right. 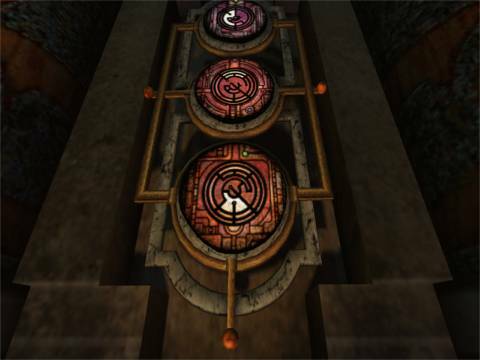 Pull the fourth lever 4 times to bring the last pillar into the highest position. Pull the third lever 3 times to raise the third pillar into the last but highest position. Pull the second lever 1 time to raise the second pillar a little. Now walk towards the pillars and climb all the way to the top and press the sixth Journey. Turn to the left and climb the stairs all the way down. At the bottom pull the lever to open a secret door. Now you are back in the room with the little control panel. Push the blue button to reset the pillars. Step behind the levers once more. Blue: the D'ni-numbers 1, 3 and 4. So number 2 is missing. So the correct order to pull the levers is: lever one 1 time, lever two 4 times, lever three 1 time and lever four 2 times. So pull lever one 1 time, lever two 4 times, lever three 1 time and lever four 2 times. Now look what is happening! Isn't that amazing? Climb all the way to the top once more and climb up the steel ladder. Enter the next corridor. Leave this blue button alone too!!! Walk all the way to the end of the corridor until you are facing some sort of room up in the sky. Be careful not to fall down from the edge. Turn to the left and carefully walk all the way up towards the room up in the sky. Before climbing up the room itself step on the little platform with some sort of device at the right side. Examine the device. Note that it has six buttons. Also note that there are symbols above each and every button. I'm sure they will remind you of painting 3 back in the room with the D'ni-numbers and the rotating images above. Now you "only" have to figure out the correct order to push the buttons by the images above the buttons. Please don't shoot me because this is quiet o long explanation! 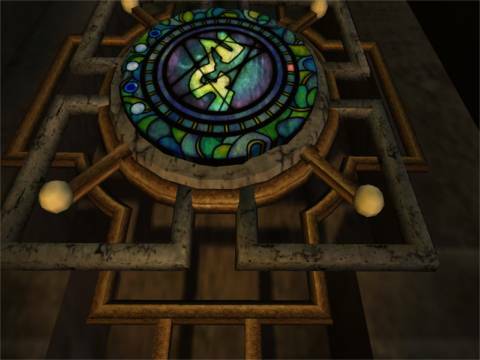 The solution to this puzzle is based on the same principle as the solution to the levers in the pillar room. As the same in that puzzle the most important thing is which numbers are missing. Because of all the symbols and because there are six buttons it's all a little complicated. First of all you have to determine which numbers are present at each button and with that which numbers are missing with each button. 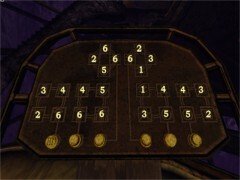 Number each button from the left to the right from 1 to 6. Notice that button 6 is the only button with one missing number now. And this number happens to be number 6. So now you know that the sixth button has to be pressed as the sixth button. So this brings you to the still incomplete order of pressing the buttons: 1, ?, ?, ?, ?, 6. Notice that button 5 is the only button with one missing number now. And this number happens to be number 2. Now you know that the fifth button has to be pressed as the second button. So this brings you to the still incomplete order of pressing the buttons: 1, 5, ?, ?, ?, 6. Notice that button 2 is the only button with one missing number now. And this number happens to be number 3. Now you know that the second button has to be pressed as the third button. So this brings you to the still incomplete order of pressing the buttons: 1, 5, 2, ?, ?, 6. Notice that button 3 is the only button with one missing number now. And this number happens to be number 4. Now you know that the third button has to be pressed as the fourth button. button. 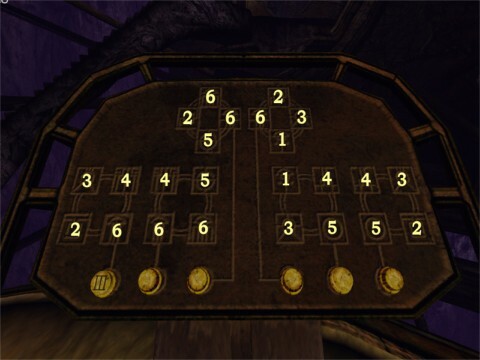 So this brings you to the still incomplete order of pressing the buttons: 1, 5, 2, 3, ?, 6. So the correct order of pressing the buttons is: 1, 5, 2, 3, 4 and 6. After you pressed the buttons in this order you'll see that a door opens at the room up in the sky. So now walk all the way up to that room. Be careful again not to fall down. Go through the opened door and climb down the stairs. Next to the dead body is a note. Pick it up to read it. Turn to the left and walk towards the back wall. Jump on the wooden crates and keep on jumping towards the wall and press the seventh Journey. Jump down until you are standing on the floor again. Have a look at the linking book on the pedestal. It's a linking book to the room with all the paintings. No need to go back there, it would just be a waste of time. Exit the room by climbing up the stairs. Go back to the little platform with the device. Go and stand in front of the device. Turn around and face the door in the distance where you entered this area. Walk straight on to the end of the platform and turn to the left. There in the distance you'll see your next goal... another Journey door. Also notice a big pipe beneath the platform leading to that door. Jump down on that pipe and walk all the way to the end. Be careful again not to fall down. At the end turn to the right and jump down the platform near the Journey door. Walk towards the door and press the hand sign. Turn around and notice two little geysers and between them a large geyser with a lid attached to it. Turn to the right and walk towards the large stand alone geyser. Kick the pedal to close the lid. Turn to the left and climb up the path. Turn to the right. Walk towards the first vase shaped plant next to the big rock. Carefully walk to the side of the path and look down. You'll see a very small ledge beneath you. Carefully step down the path onto that ledge. Turn around and press the first Journey of this Age. Now turn around and notice another small platform with a geyser beneath you. Your next goal is to land on that platform without falling into the hot glowing lava. The best way to do this is to line up with that platform and stand with your back against the wall. Do one step forward and jump. On the platform kick the lid to close the geyser. Turn around and make a run/jump to the next area. Close both geysers. Remember this place with the two geysers because you have to come back later here. Walk up the path and go to the right. Cross the stone bridge over the ravine. Follow the path and close the next geyser. Turn to the right and jump down to end up at the area where you started. Walk towards the opened big geyser and step on it. Now you know what the closing of the geysers is good for. By closing all of them the pressure will rise to much. By that all geysers will be opened. By closing all the geysers but one, the only opened geyser will have power enough to blow you away. Because this is the only opened geyser now, you will be blown away up to a small ledge. Press the second Journey. Jump down from the ledge. Now head back to the place with the two geysers you closed a while ago. Open the one nearest to the back wall. Return to your starting point and close the other geyser. Head back to the place with the two geysers once more. This time step on the opened geyser to get blown away to another area. Follow the path all the way until you reach the area with the waterfall and the lake. At the end of the path you'll find a linking book to Eder Gira at the right side. Leave it alone for now. Look around and notice a large bridge shaped rock crossing the river. Pan a little more to the left and notice another huge rock at the opposite side of the river. Walk towards that rock and cross the river. Walk towards the waterfall. Halfway there you'll pass another small rock. Examine it to find out it contains a Journey stone. Leave it alone for now but remember it is here... you're going to need it later. Now walk all the way to the end of the path to end up behind the waterfall. Go into the cave behind the waterfall. It's pitch dark in there. At the very right end and at the very left end of the cave you'll find some sort of generator. Switch both of them on by pressing the lid to get some more light. Near the exit towards the waterfall you'll find some sort of buoy. Push it into the water and shove it all the way to the river. You should place it into the river next to the big rock. Later on you are going to need this as a bridge to cross the river dry-footed. You'll learn why in just a few minutes. This is a good place to make your... bridge! Walk to the linking book. Link yourself to Eder Gira. Walk down the path until you reach the huge rock sticking up at your right side. Walk towards that rock and press the third Journey. Turn to the right and walk towards the little cabin. Get passed the right side of that cabin and walk until you're facing the rock wall. Turn to the right. Walk all the way to the end and press the fourth Journey. Head back to the path. Turn to the right and follow the path. At the right intersection you'll see another Journey door. Leave it alone for now but remember it's here. Keep on following the path and go passed the tunnel. At your right side and on your left side you'll see big brain plants. Keep on following the path to the left. In the distance you'll see big puffing plants. Climb down the stairs. Turn to the right and walk to the left side of the cabin. Turn around and press the fifth Journey. Walk towards the tunnel passed the puffing plants. Just in front of the tunnel head to the left and climb up the tunnel. Pick up the blue book with the story of Shomat. Of course you read the book. Now turn around and look at the right area with puffing plants. There's something laying on the cliff over there. Turn to the left and walk halfway down the tunnel. Line up with the rock standing between you and the cliff. Make a run/jump to that rock and jump on the cliff. Pick up the Relto page and click on the image to add it to your linking book. Jump down from the platform. Turn to the right and climb up the stairs towards the brain plants. On top of the stairs turn to the left and climb up the stone wall. Walk towards the lamp on top of the wall and press the sixth Journey. Jump or climb down the wall and walk back towards the stairs. Walk into the right area with the brain plants. Walk through the field of brain plants to find yourself a flying cloud of fireflies. Walk through the cloud of fireflies a few times to get some of them. Before you are going further you should know something about these fireflies. First of all they hate water. As soon as you are touching water or water is touching you, the fireflies will be gone at once. When you run or jump more then once, the fireflies will be gone as well. Your goal is to get back to Eder Kemo with these fireflies to lighten up some dark tunnels at the cave near the waterfall. So now you have to go back there without getting wet and without running or jumping! So when you got some fireflies gathered around you walk back towards the stairs and towards the tunnel passed the puffing plants. Walk through the tunnel and cross the water to the next cave. If you are surprised by a thunderstorm all the fireflies will be gone. In that case you have to collect some new ones. Enter the cave and link yourself back to Eder Gira. When you arrive there be careful with that geyser in front of you. Why? Because from time to time it spits steam and steam is... wet! Walk towards the river and cross it dry-footed across your own made bridge the buoy. Walk to the end of the path towards the waterfall. Line up with the cave. Now you can make only one jump/step into the cave without the fireflies leaving you. Walk to the left side of the cave and step into the dark tunnel. It's good you brought those fireflies around because it's pitch dark inside the tunnel. Walk through the tunnel until you enter another generator room. Switch it on by pressing the lid. Turn to the right and pull the lever next to the door. Enter the next room. Step out into the water passed the waterfall. Walk to the left and enter the next cave behind the other waterfall. Here you'll find another two buoys. Drop them both into the water. Step into the water and push both buoys over the edge into the lake below. 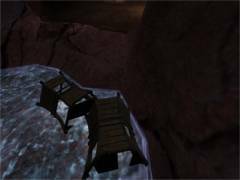 Now make another bridge by using the buoys at the entrance of the cave. You have to stash them at the spot where you jumped into the cave before. After you placed the buoys see if you can walk from the path into the cave without getting wet-footed and without jumping!!! The correct way to stash the buoys. When you are absolutely sure about that walk to the linking book and link back to Eder Gira. Walk back to the brain plants and get yourself some fireflies again. Go through the tunnel passed the puffing plants and enter the next cave. Link back to Eder Kemo. Walk across your own made bridge across the river and walk across the bridge you just made at the entrance into the cave behind the waterfall. Enter the dark tunnel once more. In the generator room turn to the left and enter another dark tunnel. Follow the tunnel until you are standing outside the tunnel. Follow the path around the cliff until you are standing in front of the gap high above the little waterfall. You can do only a one step jump across the gap without losing your fireflies. So line up with the opposite side and make that one step jump. Follow the path into another dark cave. Go to the left and walk into the circular room. Find the generator and switch it on by pressing the lid. Look around and press the seventh Journey. Now head back to the cave near the lake behind the waterfall. Exit the cave near the place where you placed the two buoys. Walk towards the little rock next to the lake and press the Journey stone. Press the image to end up in some sort of store room in D'ni-city. Read all the books and notes to learn lots more about D'ni-kings and D'ni-habits such as marriage etc. When you are finished, link back to Relto. Hmmm... nice carpet! Take the fifth (green) book from the book case. Page through the book and press the Eder Gira image. Go passed the large standing rock. Walk the path to the right and walk towards the Journey door. Press the hand sign. Enter the room and walk straight ahead into the darkness until you'll hear Yeesha again. After she finished, wait a second until the figure on the wall stops glowing. Touch the hand sign on the wall. This will make the totem disappear. Jump down form the ledge into the darkness. You'll end up at Relto once more. See that all four totems will raise. A better proof that you finished all Ages couldn't exist! Congratulations! You just finished Uru, Ages Beyond Myst!! Just kidding!!! Somehow you'll have the feeling that things aren't finished yet. That's correct! Remember that Yeesha just told you that you have to bring back what is taken. If you wonder what this might mean it's easier said than done. You have to bring back all four totems you just gathered onto Relto. I suggest you do this in the same order as you gathered them. So enter the house and take the second (orange) book from the book case once more. Press the Journey sign to link back to Teledahn. Turn around and walk towards the opened door. Go through the door and climb down the stairs. In the next room climb up the metal stairs against the wall. Enter the opened door at the end of the walkway. Walk straight on and press the hand sign of the Journey door at your right side. Enter the room and press the hand sign on the wall. 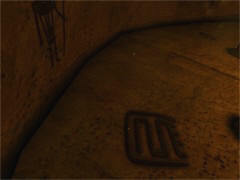 Make a note of the symbol on the floor and step down the ledge to return to Relto. Notice that the Teledahn totem has gone. And not only that... in the ground a blinking fissure appears! Enter the house and take the first (green) book from the book case. Press the Journey sign to link back to Gahreesen. You'll end up at that damned rock near the rotating buildings. Carefully walk towards the outer side of the cliff. Line up with the rock down there and make a run/jump onto the rock. Now line up with the rock with the Journey door and make another run/jump to the Journey door. Walk towards the Journey door and press the hand sign. Enter the room and press the hand sign on the wall. 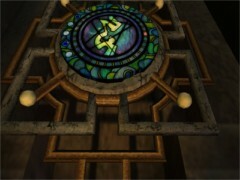 Make a note of the symbol on the floor and step down the ledge to return to Relto. When you are back at Relto the Gahreesen totem has gone as well and the fissure in the ground is getting bigger. Enter the house and take the third (purple) book from the book case. Press the Journey sign to link back to Kadish Tolesa. Turn to the left and enter the pillar room. Climb up the pillars and climb up the steel ladder all the way to the top. Walk to the end of the tunnel. Go to the left. Climb up the stairs to the platform with the yellow buttoned control panel. Face the control panel and turn around. Walk to the end at the left side of the platform. Jump down on the pipe beneath. Walk all the way to the little platform near the Journey door. Jump down and walk towards the Journey door. Press the hand sign. Enter the room and press the hand sign on the wall. 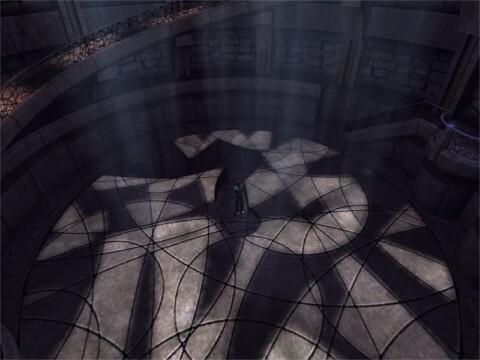 Make a note of the symbol on the floor and step down the ledge to return to Relto. When you return to Relto the Kadish Tolesa totem has gone and the fissure in the ground is getting bigger and bigger. Enter the house and take the fifth (green) book from the book case. Press the Journey sign to link back to Eder Gira. Turn around and climb the stairs towards the brain plants. Go through the tunnel passed the brain plants and head to the left to the Journey door. Press the hand sign. Enter the room and press the hand sign on the wall. 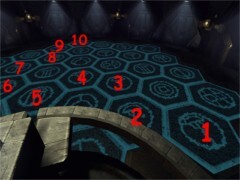 Make a note of the symbol on the floor and step down the ledge to return to Relto. Look around and notice that the four ledges are all together now and all four totems are returned now. Jump down the center hole. This time Relto is hit by a severe earth quake. The fissure opens completely now. Jump down into the fissure. Now you'll come falling from the sky into the dessert area. Walk around the volcano and enter the cleft once more. Step on the bridge leading to Yeesha's home. Walk the bridge and jump across the broken part of the bridge. Enter Yeesha's home. Climb up the stairs. Note: these symbols where the same with me all the times and every time I played the game. I'm not sure if this is the case with you too. So if the symbols on the floor with the four ages were different you have to change these four symbols on the plate in the corresponding way of course. Press the blue button. If Yeesha disappears in a few seconds, you didn't set the symbols correctly. In that case try again. When you set the symbols correctly Yeesha will pop up once more with a long story. At the end of the story Yeesha offers you another linking book. Touch the linking book in her hands. After that she disappears but not before having made some changes to the weather. Outside a heavy thunderstorm will start. Now walk towards the device at the right side of the door with the green button. Press the green button. Take the Relto page from the device and click on the image to add this one to your linking book also. Leave the room and exit the cleft. Enjoy the view over the rainy dessert and watch out for the lightings!